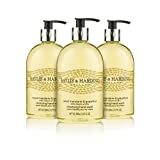 A luxury hand wash and contains vitamin A, B and C extract. It has a luscious sweet mandarin and grapefruit fragrance and comes presented in an elegant clear bottle. It is .